Airloc Forte Banana Plugs. QED Reference XT40. "The QED XT40 is a special cable – detailed, balanced and authoritative, and we think it’s worth every penny. Go treat your system.". "Everything about the XT40 is clear and engaging. superb performance at the price. QED REFERENCE XT-40 XT 2 MT. A BANANA GOLD PLATED 24K. X-TUBE TECHNOLOGY. LUNGHEZZA 2 MT. QED REFERENCE XT-40 XT 3 MT. A BANANA GOLD PLATED 24K. X-TUBE TECHNOLOGY. LUNGHEZZA 3 MT. QED REFERENCE XT40 CABLE. For best results it should be used in conjunction with QED Airloc™ Forte banana plugs. cavo di potenza connection by QED SPEAKER CABLE. CAVO DI POTENZA PER DIFFUSORI ACUSTICI DI ALTA QUALITA'. Image is for illustration only. "The QED XT40 is a special cable – detailed, balanced and authoritative, and we think it’s worth every penny. Go treat your system.". In addition, its large cross sectional area makes it suitable for long cable runs. For best results it should be used in conjunction with QED Airloc Forte banana plugs. "The QED XT40 is a special cable – detailed, balanced and authoritative, and we think it’s worth every penny. Go treat your system.". • The QED Bi-Wire Link (Speaker Jumpers Cables). 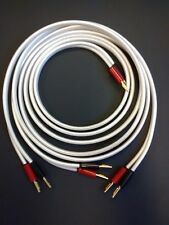 • The QED other Speaker Cables. • The QED Analogue Interconnects. LSV Cables. What Hifi Magazine's Best Speaker Cable For 2014. • Capacitance 59.0 pF/m, Loop Inductance 0.46 μH/m, Loop resistance 8.0 mΩ. "The QED XT40 is a special cable – detailed, balanced and authoritative, and we think it’s worth every penny. Go treat your system.". In addition, its large cross sectional area makes it suitable for long cable runs. QED Reference XT40. 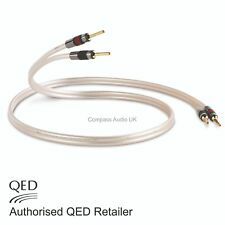 QED XT40 Reference Speaker Cable utilises X-Tube (Aircore™) Technology in a new format to bring high end cable performance. "The QED XT40 is a special cable – detailed, balanced and authoritative, and we think it’s worth every penny. QED REFERENCE XT-40 3M PAIR CABLES SPEAKERS. Winner of 'Best speaker cable' at the 2014 What Hi-Fi?. For best results use QED Airloc™ Forte banana plugs. 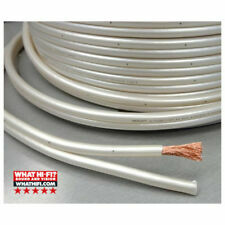 In addition, its large cross sectional area makes it suitable for long cable runs. Image is for illustration only. For best results it should be used in conjunction with QED Airloc Forte banana plugs. "The QED XT40 is a special cable – detailed, balanced and authoritative, and we think it’s worth every penny. La XT40, che è stata rilasciata per il 40 ° anniversario della QED, è stata immediatamente premiata con il titolo di Speaker Cable of the Year 2014 dalla rivista specializzata britannica "What Hi-Fi?" Dopo una valutazione a 5 stelle. We are so confident about the performance of the new XT40, we urge enthusiasts to audition and compare it, not only to their favourite cable but also to alternative models at any price. Headphone Amplifiers. The QED 40 is designed to have a very low resistance per metre with its 4mm² cross-sectional area and is easy to terminate.